It has been a busy few weeks here at Busy Bees and the reason I haven't blogged for a while. The ladies have been very busy catching up with work as we head towards the last few weeks of Level 1, I can't believe how quickly this time has passed and so much wonderful work has been produced, I am really looking forward to the exhibition on our workshop programme open day on Saturday 21st July 2018. This week and next week we are covering machine applique and reverse applique. Two very exciting techniques that are probably the most used techniques when it comes to textile art. Applique meaning to apply one fabric to another in a decorative way either by applying a shape such as a flower or bird. 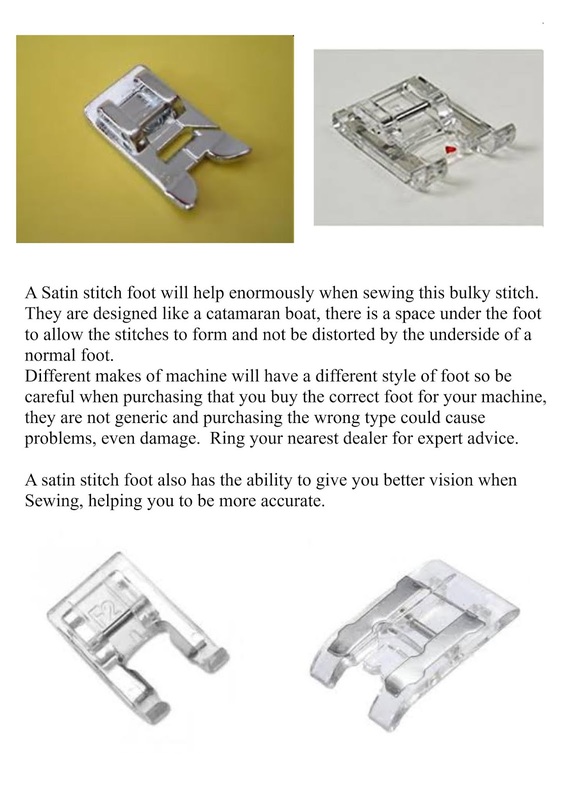 Most people when thinking about machine applique will be familiar with the words satin stitch, a close zigzag that firmly holds the shape to be applied in place. To achieve this stitch on your machine as long as it has a swing needle (not a straight stitch machine) you will need to be able to alter the length and width settings to achieve this decorative stitch. Not all machines are able to do this so check your manual first to make sure. 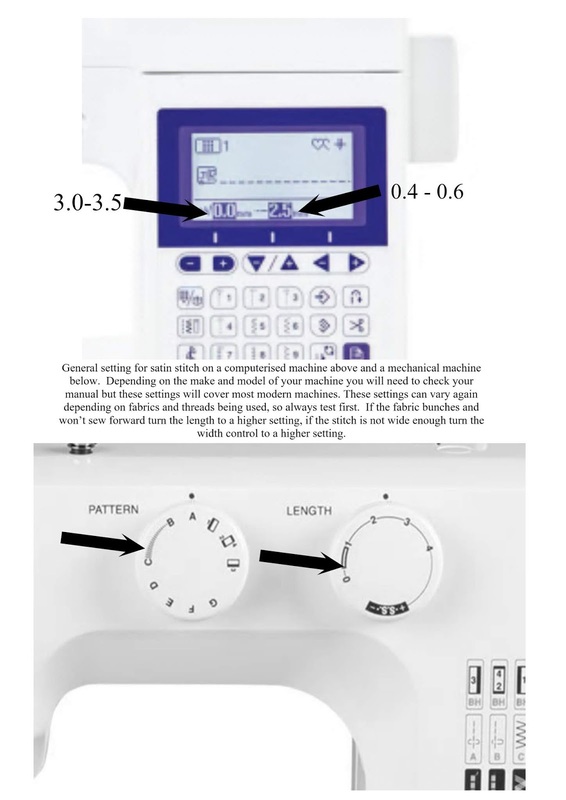 The general settings for most machines is to set the pattern dial or from the digital display select the zigzag pattern and then adjust the length 0.5 or close to 0 but not too close because setting the machine to 0 tells the feed dog to sew on the spot, but you need to be fairly close in order for the stitches to sit side by side. Always test first on a scrap of fabric and if the foot moves freely and the stitches are close then you have found the right setting. To set the zigzag either change the numbers to 3.0 or 3.5 or turn your pattern dial so that the bars are set just above the middle position. Most mechanical machines have a width maximum of 5 which relates in size to 5 mm. A computerised machine generally will have a setting of 7 mm. Always test your settings because things can change when using thicker threads or fine threads, or thicker fabrics etc. Applique is such a useful technique to learn, you can be so creative with it, from your choice of design through to your choice of fabrics and threads. It can be intricate in pattern or cover large areas the possibilities are endless! Before the invention of wonderful Bondaweb, (a sheet of glue attached to a carrier sheet that bonds through heat application) applying shapes, especially small shapes would take a considerable amount of time and skill. Bondaweb a brand name for this mesh of glue, securely holds the shape in place while stitching, it also prevents fraying on fabrics of that nature so applying any type of fabric now need not cause too much concern. The carrier sheet resembles tracing paper and the design can be traced onto this cut out roughly around the shape and then bond to the reverse or wrong side of the fabric to be applied. Cut out the shape when attached to the fabric, peel away the paper and then place onto the background fabric right side up and iron into place with a medium to hot iron, making sure the glue on the reverse is well and truly adhered to the background. When you have applied your shape, with machine set correctly and the satin stitch foot on the machine continue to sew around your design making sure that when the needle of the machine falls into to left position that it passes through the applique and the background and that the right fall of the needle only goes through the background material. Covering the raw edges of the applique shape. When it is time to turn or work your way around a curve if turning clockwise, leave the needle in the fabric on the right fall and pivot back into position rather than dragging the fabric around, this will cause the material to pucker! If your turning anti clockwise then leave the needle in the left fall and pivot for that direction. If you find the material is puckering you can also place a piece of stitch and tear interfacing to the reverse to give more substance to that area. Satin stitch has a tendency to pucker the material especially fine fabrics because of the concentration of stitches, changing the tension to a lower setting can also help with this problem, again testing first will throw up these problems so that when you approach your finished work all problems should be ironed out. Next week I'll explain a little about reverse applique and how it can help apply fabrics in a more intricate way. Here are some pictures of what the ladies have been up to recently, not so many now as pieces are being finished and we only have a few more techniques to cover. Some samples of transfer painting. Trying out Markals on different surfaces including sticky back plastic, scrim, and lutradur. Below, a rubbing with markals from a Garden seat no less !!! Inspiration is all around us even where we sit! Keep your eyes and mind open and you will be surprised what comes to mind when looking at an object in a different way. Celia had some old keys and they have come to tell a story about the suffragettes and the emancipation of women. The key in her piece is a representation of the women who chained themselves to railings to fight for the cause, a key was needed to release them from their chains physically and metaphorically! It will be quite a profound piece when finished. Well I think that's enough for this week, hope you find some time to stitch this week or maybe start a sketchbook of ideas, jot down some ideas or little drawings and scribbles see what come to mind. Enjoy the sunshine while it's here too!